Besides layout area, Sanya also plans to have three industrial districts:it has the belt-shaped distribution along 225 federal highways, the coordinated unification, auxiliary melts supplemented mutually. Sanya technology&industry District: Sanya technology, industry and trade garden area of Sanya,the Lizhigou town, mainly develops the aquatic product processing, food and the traveling leisure convenience food processing, the new building materials and the traveling handicraft processing. Sanya high technology and new technology industry District: it is located east line highway at the entrance of Damao tunnel, mainly develops the biological drugs manufacture, the traveling commodity development, the high fine electronic products production and the software development. Meishan industrial district: it is located the cliff state bay, is distanced 7.5 kilometers with the plan area coast, it will be used for follow-up industry of New City of originality. Road: the west line highway passes along the layout area east side, and enters the layout area in the east south side. The west line highway is part of Hainan rotary island highway, it may lead to Haikou and other coastal cities; Along the city road, it may lead to the Sanya down town, Nan Shan Yalong bay, then connecting east line highway. Waterway: in the layout area it has the only freight port in Sanya,after completed construction it may lead to the Hainan Province various ports and the domestic and foreign destination port. Railway: The layout area is close to railroad freight terminal, it is connecting Nan Shan freight port and then use nearby the railway to reach the other city in China. Aviation: The layout area is away from the Sanya Phoenix Airport approximately 30 kilometers. The throughput of Sanya Phoenix Airport is over 9 million people in 2010. Gradually it will develop into south China the biggest air harbor. Water supply: The layout area supplies water at present by the Yacheng water supply factory, this water supply factory design water supply scale is 12,000 cubic meters/days, the first period 6,000 cubic meters/days, the present situation water supply scales is 1,400 cubic meters/days. Power supply: South side the layout area has the Nan Shan power plant, total installed capacity 132,000KW,connecting Yazaitang 220KV transformer substation high voltage line, connects the power plant special purpose water pump station the 110KV high voltage line. Fuel gas: In the Layout area altogether has three Nan Shan gas station; it is the natural gas transfer post of South China Sea oil field 13-1. Communication: The layout area will be covered by wireless communication, the ADSL and the wire communication carries on along with the infrastructure synchronization. Policy advantage/A lot of favorable policies from government have been mapped out, such as taxation, land lease, capital in draught, construction approval and high-tech person with ability. Resources advantage/Green biology, marine kinds are so many in Sanya.The underground mineral resource is rich, underground it contains the multitudinous treasures, and the development value is being high. It has provided the broad prospect for Sanya,s social economy development and the lives of people. Culture advantage/Sanya has a lot of Li,Miao,Hui nationality, the Chinese multi-nationalities live together, it is also the international waterway stopover station since the ancient times ,simultaneously also was senior official’s exile place at ancient times, it has gradually formed the cultural characteristic and create different cultures. Teaching conditions/In a very short few years,Sanya library and 3 universities have been established; they are Sanya aviation tourism institute,Sanya City Tourism University,Sanya Institute of Hainan University. The accomplishment of Sanya institutes of Hainan University has changed the history that there was no compositive university in Sanya. Study of originality: Digital study ,software study,3G Service, study of increment service, study of information service system. Design of originality: industry design,layout,architecture,city planning,landscape,view,interior design,civil design and game design. Culture of originality: originality of ethnic and folk customs. Originality of art,sculpture,calligraphy,photography and web media. Originality of Exhibit: Originality of trade, international design, digital movie experience. Electron information industry: technology of micro-electronics(microelectronics integrate circuit design,facture,encapsulation and testing),automobile electron mobile communication’s study and manufacture, next generation internet and solar industry. Bioengineering industry: biology product study,manufacture,examination;Oceanic biology study and no pollution production,etc. New energy sources industry: make full use of solar, wind force,tidewater,hydrogen and study of energy saving technology. International knowledge property right forum: instauration of forum headquarters,secretariat,event center,reception center,multi-function ballroom. International knowledge property right trade center: trade center, exposition center, authentication center, service centre. China originality (knowledge property right) fund: Fund office, activity center, providing related law and policies, assist weak-influence colony. Business hotels: to provide accommodations and business service during exhibition and event. Training center: responsible for training people who are professional for accepting, recording and handing a case, customer supporting,feedback,follow up service. New City of Originality is to plan to build up the institute which has a capacity of 8,000 people. After accomplishment, it will bring a lot of professional people who has management skill of knowledge of property right, knowledge of property right protection and sales related. Nan Shan is the only sea port freight in sanya ,it is also the closest port to Xisha,Zhongsha,and Nansha islands, It will function mainly as port operation area and storage area. Setting up storage between ports and later can be changed into port develop area. International estate and intelligence Club: international business activity, platform for international communication; handing official business and activities place for domestic and overseas knowledge property right institute,agency,and enterprises. Software exploitation: develop potential software exploitation enterprises, to create a platform for China and worldwide advanced software products. Website and electronic business: to introduce developing website appliance platform, which will help to enrich and make more comfortable for life environment of people. Base of Long-distance dummy experimentation. Domestic and abroad study institute of long –distance dummy experimentation. New city of Originality adjoins Nan Shan Temple,Daxiao Dongtian scenic attractions. It is very potential to develop tourism to build up a high quality tourism industry. We plan to set up yacht dock and yacht at the sea entrance of Niyuan River, constructing many Resorts to act as hotel and exposition supplementary. On land, we will build up a central park, Tropical botanical Garden, street park,etc.being places for people to relax. We will also build up exposition center, originality product experience center, digital movie experience center, international originality design exhibition for people who want to develop sea view business buildings and accommodations. This layout is a combination of business and inhabitancy. They benefit both and bring a lot of benefits. 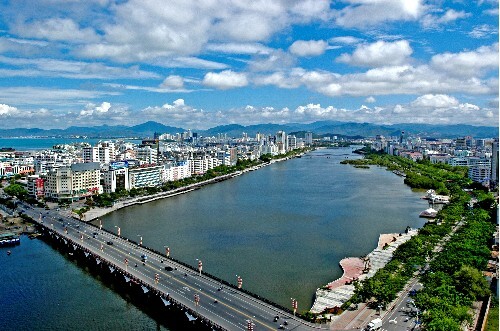 The Sanya New City of Originality project begins, it receives social well-known enterprise and individual attention, New City of Originality attracts a lot of well-known enterprise by its outstanding investment environment, swift and violent development situation and profound development potential. Shenzhen Zhongxing,Hainan Haiyuntian,Sanya Fenghua,Sanya Beijing University Tech.District,the Chinese nuclear power,Suzhou Snails have signed contracts with Sanya New City of Originality of investment, the first batch project total investment amounts to 12.1 billion yuan. With the Sanya New City of Originality’s construction work, a lot of well-known enterprises will come to discuss of investment. The Sanya New City of Originality has the government support, attentions from society, solid foundation of famous enterprises, its development prospect is inestimable. In 2020, New City of Originality Sanya will be built into a city consisting originality industry, new technology,exposition,training,study and development, port freight, living area. It will become a world class harmonious ecology, economy up-growth, a completed set system and advanced management area.High-grade industry and people will assemble here to build the modern industry base and the City Culture to show the beautiful city view. Science and technology create super excellence, originality founds resplendence, and Beauty is just in touch. We can develop together with the beautiful Sanya.